Welcome to Marvel Strike Force Minions page. This is the full description of MSF Mercenary Lieutenant stats, skills, and abilities. In Marvel Strike Force, Mercenary Lieutenant is a Mercenary minion who buffs up his allies. A mercenary is an individual who fights for money in various types of armed conflicts and who is not part of any government or political cause. In the Marvel Universe, the most famous mercenaries are Deadpool, Bullseye and Korath the Pursuer. Mercenaries have no nation, they don’t worship any God and have only one boss – money. Mercenary Lieutenant is kinda expensive. His price is 45 shards obtainable through 3-3 Villains campaign mission, 6-3 Nexus campaign mission, violent vigilante orbs, and premium orbs. Mercenary Lieutenant is versatile support with high speed and ability to provide his allies with energy and offense up. He also has a passive ability to heal a portion of the health of his allies at the start of each turn. Mercenary Lieutenant cannot be summoned by Kingpin. Mercenary Lieutenant is a field leader who makes allies faster and stronger. On Turn, 25% chance to heal Lowest Health ally for 15% of this character's Max Health. If ally is MERCENARY, heal for + 25% of this character's Max Health. 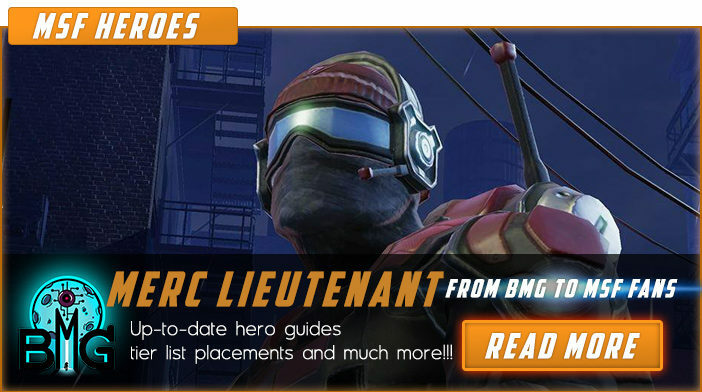 We hope that you enjoyed the description of MSF Minion Mercenary Lieutenant. For detailed information about other MSF Characters check our MSF Minions page.